At the invitation of the governments of Russia and Belarus, Vice President Wang Qishan will attend the 22nd St. Petersburg International Economic Forum (SPIEF) in Russia and visit Belarus from May 24 to 29. At the invitation of State Councilor and Foreign Minister Wang Yi, Deputy Prime Minister and Minister of Foreign Affairs of New Zealand Winston Peters will visit China from May 24 to 27. Q: Venezuela's incumbent President Nicolas Maduro was reelected in the presidential election. Many countries have strongly condemned the unfair practices in this election, and the US and the EU also expressed concerns over it. China and Venezuela have very close ties, and does China believe that this election was fair? Has the Chinese side expressed its congratulations to President Maduro on his reelection? A: Regarding the election in Venezuela, China has followed the principle of non-interference in others' internal affairs as always, and we believe the Venezuelan government and people are capable of handling their domestic affairs. In the meantime, all parties should respect the choice of the Venezuelan people. The dispute, if there is any, should be properly settled within the existing legal framework of Venezuela. As to your last question, China will handle that in accordance with its diplomatic practice. Q: In response to the takeoff and landing of the Chinese Air Force's H-6K bomber in the South China Sea last week, the Pentagon said that China's continued militarization only serves to raise tensions and destabilize the region. The Philippine Foreign Department also said it had expressed concern through diplomatic channels. What is your response? A: The South China Sea Islands are China's territory. The relevant military activities are the normal training of the Chinese military and there is no need for other parties to over-interpret that. As to the so-called "militarization" mentioned by the US, the normal training on our own territory is totally a different thing from certain country's threat to others by sending military vessels and aircraft to this region from thousands of miles away. With regard to the specifics of this training, China's military has issued a readout and I would like to refer you to that. Q: First, how is the China-Russia relationship faring? What is Vice President Wang Qishan's schedule at the SPIEF? Second, Vice President Wang Qishan will visit Belarus after his attendance at the SPIEF. What is his schedule in Belarus and what is your comment on China-Belarus relations? A: Regarding your first question, the China-Russia comprehensive strategic partnership of coordination is at its historical best. Under the strategic guidance and personal care of the two heads of state, China-Russia relations have been growing at a high level with full and fruitful cooperation across the board and close coordination on international and regional issues, thus jointly making important contributions to promoting world peace, stability and development. During his attendance at the 22nd SPIEF, Vice President Wang Qishan will take part in relevant events and have an in-depth exchange of views with Russian leaders on bilateral relations and major issues of mutual interest. The Chinese side is in touch with the Russian side on the relevant arrangements. We believe that this visit will help step up bilateral high-level exchanges, deepen bilateral cooperation in various fields, and scale China-Russia comprehensive strategic partnership of coordination to new heights. Regarding your second question, China-Belarus relations have reached a new stage of comprehensive strategic partnership featuring mutual trust and win-win cooperation. The two sides are enjoying frequent high-level exchanges, stronger political mutual trust, and more fruitful outcomes of the Belt and Road Cooperation. In Belarus, Vice President Wang Qishan will have an in-depth exchange of views with the Belarusian leaders on bilateral relations and visit the China-Belarus Industrial Park which is an important project under the Belt and Road Initiative. The Chinese side is in communication with the Belarusian side on the relevant arrangements. We believe that this visit will contribute to promoting the China-Belarus comprehensive strategic partnership and all-around cooperation and creating a sound atmosphere for a meeting between the two heads of state during the SCO summit. Q: The SCO National Security Council Secretaries will hold a meeting this Tuesday in Beijing. Can you give us any details on its agenda and how will China conduct security cooperation in the SCO framework? A: I talked about this meeting last week. It will be held on May 21 and 22. The Chinese leaders will meet with the national security secretaries of the SCO member states. State Councilor Zhao Kezhi will host this meeting. As for the SCO security cooperation you mentioned, we all know that with profound changes taking place in the international landscape, the SCO members face an increasing number of common threats and challenges which must be addressed by consensus-based and collective efforts. These major challenges are: first, to maintain regional peace, security and stability; second, to combat terrorist forces in the region as well as transnational crimes including drug trafficking. This is the inaugural meeting of the SCO National Security Council Secretaries after the SCO enlargement. We hope and we also believe that as the SCO family gets bigger, its potential in security cooperation will be further unleashed and more outcomes will be achieved in this field. Q: It is reported that Iran, China, Russia, France, Germany, and the UK will attend a meeting of the Joint Commission of the Joint Comprehensive Plan of Action (JCPOA) in Vienna on May 25. Iranian Deputy Foreign Minister for Political Affairs Seyyed Abbas Araghchi said that the meeting will discuss the impact of the US withdrawal from the JCPOA and the implementation of the JCPOA by the remaining signatories. Can you confirm that China will send a delegation to the meeting? What is your expectation for the meeting? A: I have noted relevant reports. It is true that the EU, as the coordinator for the implementation of the JCPOA, is coordinating with Iran, China, Russia, France, Germany and the UK to hold a Joint Commission meeting in Vienna on May 25 to discuss relevant issues concerning the implementation of the JCPOA. 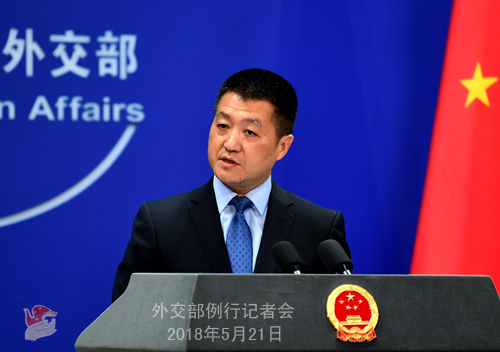 China will remain committed to preserving and implementing the JCPOA. The current arrangement is that Director-General Wang Qun of the Department of Arms Control of the Foreign Ministry will lead a delegation to the meeting. Q: US Treasury Secretary Mnuchin as well as the IMF and the World Bank have urged China to join the Paris Club and raise transparency standards in loans to foreign government. Will China consider joining the Club, and if not, why not? A: We have responded to similar questions before. China's outbound economic cooperation and assistance harbor no ulterior motives. The most important thing is that we have never attached any political strings to them. Our investment and financing cooperation with some developing countries, the less developed partners in particular, is meant to help them close their financing gap, improve their local environment for economic development, and enhance their attraction for foreign investment so that they can realize self-driven development. Such cooperation has never deviated from the principle of equality, openness, transparency, mutual respect and win-win cooperation. It upholds justice while pursuing shared interests. It observes market laws and the universally-acknowledged international rules, without losing sight of the sustainability of debt and development. For the relevant country, their time and efforts would be better spent on doing something real to support developing countries than on slandering other people's positive efforts. If they still have suspicion, I suggest they make a trip to those beneficiary countries and ask around, the local government and people will tell them their honest opinion. Q: Several US officials have indicated that the agreement reached between China and the US on trade issues just represents a temporary truce. Do you expect a longer term reversion to trade tensions as well? A: I would like to say that China is never willing to see any tension between the two sides, including that in trade or other areas. If we, as two major countries, can maintain sound bilateral relations as well as interaction and cooperation across the board, it will surely better serve the interests of the two countries and peoples and bring benefits to the world than otherwise. 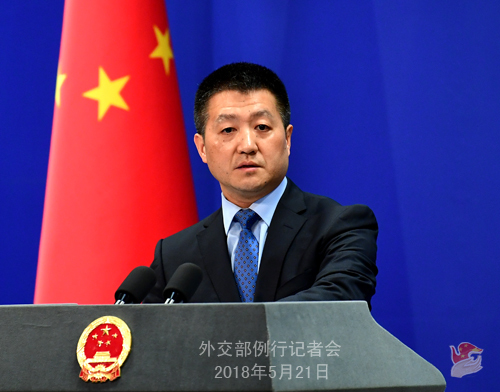 You mentioned the outcomes of the latest round of trade talks in Washington, on which both China and the US have issued a statement. You may have noticed that the two sides recognized that as two large economies, it is in our interests to reach consensus and avoid the imposition of tariffs on each other's exports as well as a trade war. This has been made very clear by Vice Premier Liu He in his interview with the media at the conclusion of this round of negotiation. The most remarkable consensus and outcome of this negotiation is that the two sides have recognized that the economic and trade issue need to be properly resolved through negotiation, and we should avoid the imposition of tariffs on goods imported from each other. Like I said last week, we hope we can give a better play to the mutually beneficial and win-win nature of China-US trade ties. Follow-up: I guess the scenario now is that the US will escalate trade tensions and temporary agreements are reached, then after a brief lull, there will be another re-escalation. Does China find that pattern concerning? Do you want to warn the US side that it is an inappropriate way to behave? A: In the short term, if the Chinese and US governments can reach a very good agreement and an outcome that is acceptable to both sides, then the two governments for sure need to abide by such agreement and we indeed don't want to see any reversion on the US part. We believe this result is what the people and business community of the two countries welcome so much and the world at large is so pleased to see. If we look at this in a longer term, there have been some ups and downs in the past four decades of China-US bilateral relations, including in our trade ties. With growing interactions between these two large economies, we can hardly guarantee that there will not be any more friction, difference or divergence in the future. But the past four decades have indicated that the fundamental reason why the two sides can properly manage differences and promote greater development of our economic and trade relations is that the development of such relations are in the interests of the two countries and peoples and that the market rule has played an important role in the context of globalization. As a result, we certainly don't want to see any more reversion in this regard. Indeed, we are convinced that for anything that is good to our two peoples, the two governments have the responsibility to get it done. 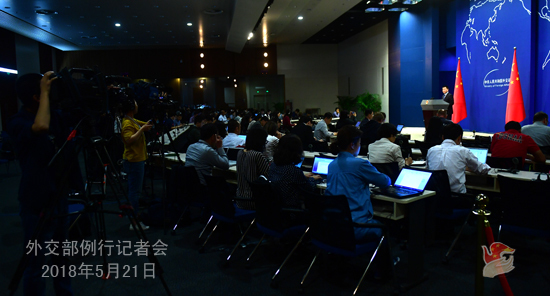 Due to scheduling reasons, the regular press conference of the Foreign Ministry on May 22 (Tuesday) will be held at 2:00 p.m. at the same venue.